The tour takes place on the former Nazi Party Rally Grounds, where the National Socialists held their elaborate annual propaganda spectacle. 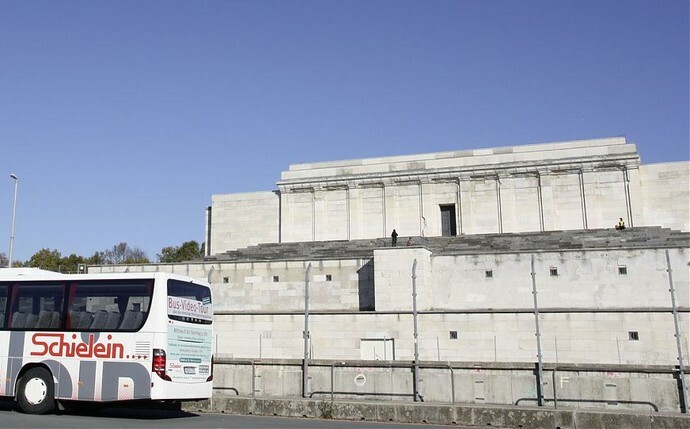 The tour provides an account of the use of architecture as a theatrical backdrop to the various events, explains the function of the rallies themselves and the way in which Nuremberg has dealt with its National Socialist legacy. Numerous historic fim clips will be shown during the tour. English commentary provided by local guides. Further reading: "THE NAZI PARTY RALLY GROUNDS NUREMBERG. A Short Guide" and "THE NUREMBERG TRIALS. A short guide"
Buchen Sie diesen Rundgang an Ihrem Wunschtermin in englischer Sprache. Kontaktieren Sie bitte hierzu unseren Partner "Schielein Reisen" unter info@schielein-reisen.de oder 0911 64206436. Dogs: Dogs are allowed if being transported in a suitable box.